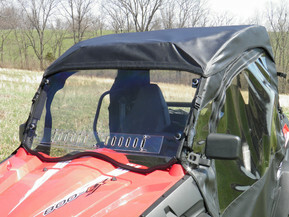 GCL UTV Camo Enclosures in stock and ready for immediate delivery for hunting season. Gotcha Covered, LLC launched a new line of Utility Terrain Vehicle (UTV) Hunting Enclosures this year at their state-of-the-art facility located in the heart of Central Kentucky. Gotcha Covered manufactures premium enclosures for Hunters that use leading Utility Terrain Vehicles and market the product line under their GCL UTV brand name. 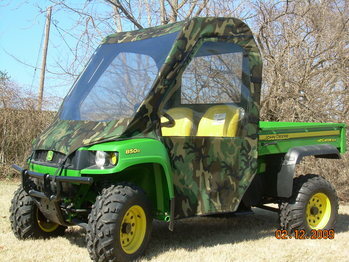 GCL UTV designs and manufactures UTV Enclosures in 3 Military Camo Patterns to support the needs of hunters everywhere. Enclosures are available in National Guard, Desert Storm and Army Combat Uniform Camouflage patterns. GCL UTV brand Camouflage Patterns support John Deere, Kawasaki, Kubota, Yamaha, Polaris, American Sportworks, Honda, Husqvarna, Arctic Cat and other leading UTV OEM Brands by providing the best camo enclosures on the market today. UTV Hunting Camouflage patterns / colors can be viewed at www.glcutv.com. GCL UTV plans to be the leading UTV Hunting Enclosure provider in North America by offering more New and Innovative Camouflage Designs. Leading designs will include zip-out vinyl windows with inside / outside dual slide zippers, heavy duty Mil-Spec fabric in a variety camouflage patterns and colors as well as tinted and clear Lexan fixed windshield kits that together provide complete protection in all UTV Hunting environments. Hunting Enclosures are offered in Full Cab Enclosure, Door / Rear Window, Top Cover and Mini-Cab configurations to meet the various demands of UTV Hunters everywhere.